Our featured 40% silver coins are Kennedy Half Dollars minted from 1965-1970. 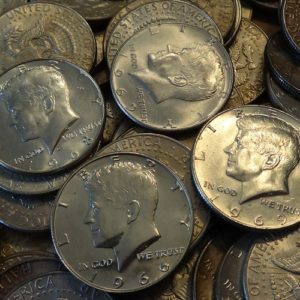 Also referred to as “clad” coins, the 1965-1970 JFK halves have an inner layer consisting of 79% copper and 21% Silver. The outer layer is 20% copper and 80% Silver. The aggregate metal content of the two layers is 40% silver and 60% copper, hence the term “40% silver”. 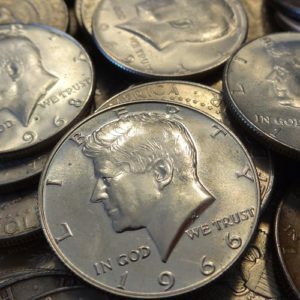 These 40% “Clad” Kennedy Half Dollars were the last regularly circulated silver coins produced by the U.S. Mint. They are also one of the lowest premium silver products available in bulk (and the copper is free!). From 1971-1976, the US Mint also produced Eisenhower Dollars with a 40% Silver content. These “Ikes” were not widely circulated. We do have them from time to time, so if Ikes are your thing, please give us a call for current prices and availability. Thanks. 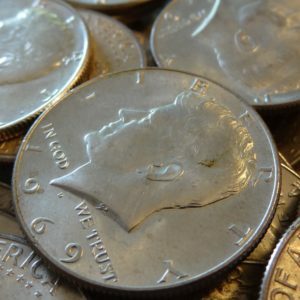 Prefer 90% silver coins? Please click HERE for our great selection of U.S. silver coins minted in 1964 or earlier.